3 bedroom chalet with sauna in ski and summer resort. Sleeps 6. An all-wooden chalet with south facing balcony and terrace situated in the heart of Borovets, the oldest ski and mountain resort in Bulgaria. It is in a quiet spot by ancient pine trees, within 3 min walk of shops and amenities. The nearest gondala is a 4 min walk away. The chalet is well insulated and very comfortable in all weathers. The master bedroom upstairs opens to the balcony, with a view of the mountain, and the terrace provides plenty of space for enjoying the sun or eating outside in the summer. There is an open plan living with lounge area, kitchenette and dining table. There is a sauna which is perfect to relax in after a tiring days skiing. Linen and towels are provided and the chalet is cleaned daily. The chalet has WIFI , cable TV, and DVD player. 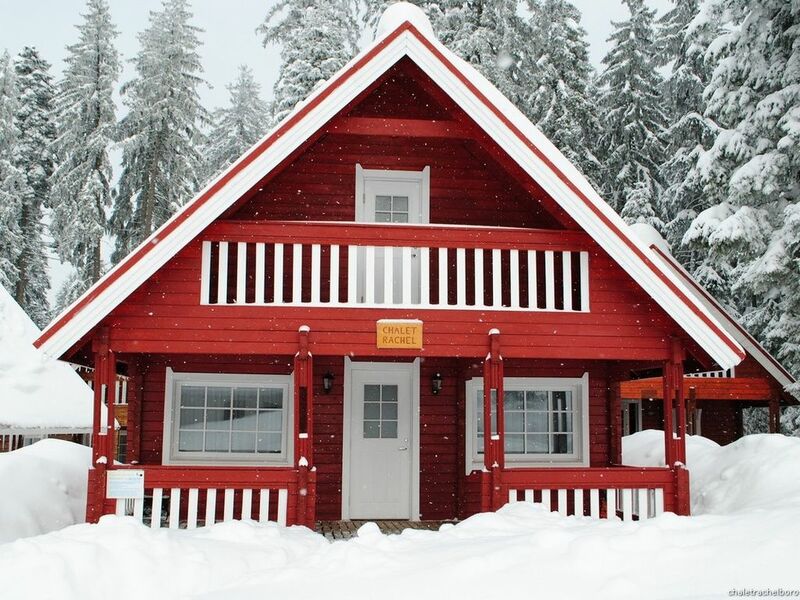 The resort: The chalet is in the beautiful ski and summer resort of Borovets, in the Rila mountains. The chalet is in a quiet location away from the main street, amongst pine trees and close to a stream. The shops and restaurants are under 5 mins away. The resort is popular with famiies and groups of friends. It is great value and is a very friendly resort. The amenities in the hotels, such as swimming, games, gym are available to use. The town of Samokov is 10 mins away by taxi/bus, and Sofia, the capital, with its extensive shopping and sightseeing, is only an 80 minute drive away. Summer holidays: Borovets is peaceful and relaxing in summer. The mountains are carpeted with wild flowers, and there are numerous beautiful walks. Spectacular views, can be had from Moussala, the Balkan penisular's highest peak (2,925m). The Gondola is open for access to the high walks. Guides are available for short walks and overnight treks, also for hunting and fishing, and off road drives through the mountains for a wilder view of nature. Horse-riding, mountain-biking, and tennis can be found in the resort and Lake Iskar 20km away. Resort activites: Swimming, bowling, gyms, shooting range, games, solariums, jacuzzi and massage are available at the large hotels. There is also horse-riding, toboganning, ski-doos, sleigh rides, & cleared walks in winter. There are numerous restaurants with a wide range of international cuisine at exceptionally good value, and many friendly bars. The apres ski has something for everyone. For those who like a late night there are nightclubs and discos which are very lively. Next to the bathroom is a separate sauna. We absolutely loved the chalet! Everything you needed was there, great location, very clean! We hoping to book again for next year! Thank you for great stay! Property has everything you need for a perfect stay. The chalet was ideal for the 6 of us. It was warm and clean. The kitchen area was basic but fine for our needs. No one skiing cooks, there are too many restaurants about. The only niggle was the bottom sheets to 2 beds were too small, leaving the mattresses exposed. One bed had a quilt cover with a very large hole in. Worth the money, quiet, 10 minutes from the slopes, clean, warm, close to supermarkets. Thanks very much for the review and I'm glad you liked the chalet. I will take note of the sheets and just to point out the large hole is actually a design! The local duvet covers are made like that to show the flowery pattern of the duvet underneath! Sorry to hear the neighbours were noisy - its not usually a problem as the chalets are pretty sound proof (I don't think I've ever heard them, but there's always a first!). Always worth speaking to the people who manage the chalets to have a word if it ever is bad. Glad you like the chalet though, and thanks for the review. Oh and for the ladies there is a great hairdryer down stairs in the bedroom. We loved our time and will defiantly book again. What a lovely review! Thank you. I'm so glad you enjoyed your stay and look forward to you coming back. Borovets lies at the foot of Mount Moussala (2925m) in the pine forests of the Rila Mountains, at an altitude of 1350m. It is only 70 km from Sofia, the capital of Bulgaria and 126 km from Plovdiv. Ski: Borovets ski area is situated in the Rila mountains at 1,300 - 2,560M. The chalet is a 4 min walk from the main Gondola. The season runs from mid December until April. There are 45 Km of pistes, for every level of skier and snowboarder. There are flood-lit slopes for night skiing. Ski and Snowboard packages are good value and excellent instruction is avaiable for both. Ski kindergarten provides whole day care for younger children. Information on ski packs, tuition, passes can be provided.